Blue Water Canvas & Upholstery can custom design and build an enclosure for the cockpit of your boat. This is an excellent way to add more usable space year-round with Florida’s rainy season. 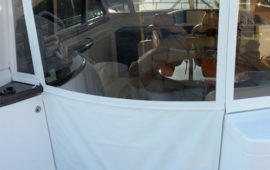 We specialize in creating custom enclosures that don’t impair your abilities to enjoy your vessel. Adding a canvas enclosure to your boat not only gives you more usable space year round but also makes cruising more enjoyable. 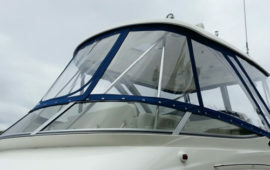 An enclosure can truly make the difference of whether or not you decide to go out on the boat for the weekend. For example, the weather forecast is for wind and rain. With an enclosure you can be at the helm staying warm and dry while underway. This fact alone can greatly influence a spur of the moment decision to go out on the boat for the weekend.